1) B plays to A and closes. A performs a step-over and accelerates then plays to C and repeats process. (repeat with Torres move) Dynamic stretches at intervals. 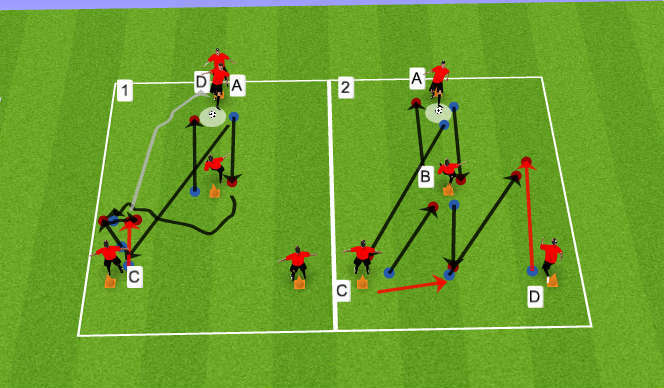 Progression: B passes and closes quickly, A performs 3 protective side moves and turns out. 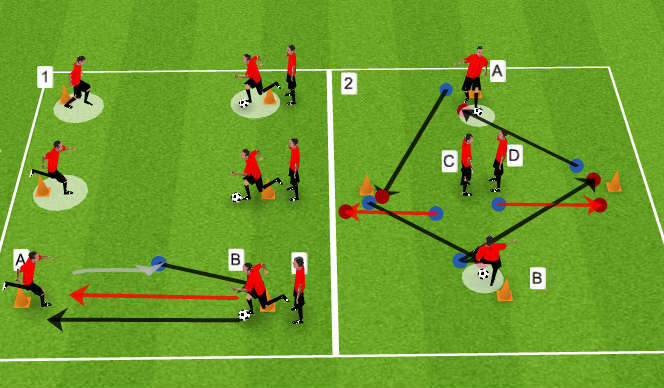 (1) A to B who checks away and sets back and then A plays into C, B then spins and round the cone and plays a 1-2 with C who then plays into D, each player follows pass (repeat the other way) Progression: receive and turn on inside and outside of the foot. (1) 5 V 5 possession game. 3 touches max focusing on body posistion, receiving skills and quality of pass. Empahsise principles of system and also focus on putting the receiving skills, quick-play, communication, movement off the ball.